I may have listened to this too close to reading Little Tales of Misogyny. It pales in comparison. 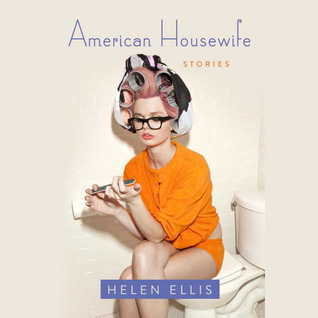 American Housewife is a collection of twelve short stories* by Helen Ellis. They are similar in theme as they are about wives of some variety and the women are all a little kooky. They seem to be a particular kind of American woman: wealthy and white. What I can say about American Housewife is that there are a lot of good ideas here but nothing really struck me as great. It was...okay. Some of these stories were lists and that got old pretty fast. I don't mind lists, as long as you got some meat to your collection. The email exchanges between the two women in The Wainscoting War were entertaining with things getting catty in a hurry. I found Dead Doormen to be both dark and sad- a woman marries a man who treats her like a glorified maid. Hello! Welcome to Bookclub was not what I expected and I kind of liked that. In the end, I thought most of the stories rather forgettable. A few made me chuckle, but there was nothing that stuck out. *If lists can be counted as short stories??? About the Audio: The short stories were narrated by a number of women. They all did a fine job. I felt the exact same way about this one! I enjoyed Dumpster Diving and The Bra Fitter and thought the others were just okay...nothing more. I liked The Bra Fitter too. Overall, it was okay and that's all. This one's getting mixed reviews so I may skip it for now. I have to say, though, that I adore that cover. I love it too! So kitchy! Yeah, no. Definitely not for me. Lists do tend to be rather forgettable. I wonder how this got published.